Sometimes fathers and sons have absolutely nothing in common. One of them is a hard working and studious human being. Whereas the other one is a lazy f*cker who thinks' that the world owes him a living. Anyway, that's enough about me and my Dad, why don't you watch this 45 minute documentary made in 1999 about the Lee's. In this episode of 'Famous Families', Mariel Hemingway introduces us to the life and times of the Lee Family - comprising of Bruce, Linda, Brandon, and Shannon. Now to enhance the overall chronicling of this tale, on show there's archive footage, stock photography, plus pre-recorded interview carried out with Linda, Shannon, Kareem Abdul-Jabbar, Raymond Chow, James Coburn, Miguel Ferrer, Dan Inosanto, Taky Kimura, Robert Lee, John Little, Van Williams, and many-many more. BRUCE IN HONG KONG: The young Bruce Lee had many different influences whilst growing up in Hong Kong. His father's acting career gave him the outlet to perform in numerous juvenile roles. His mother's dual heritage gave him the perspective to treat others as equals. His home life was curbed by the Japanese invasion and foreign rule. And his martial arts instructor, Yip Man, bestowed onto Bruce both a way of defending himself, as well as a way of tempering his own violent tendencies. But alas, Bruce's behavior was not always so tame. And he was forced to leave Hong Kong for America - a place where he was born. THE RISE AND FALL: Conceptually speaking, I am afraid to say that Bruce's time in America was somewhat of a bi-polar experience. On the one hand, he was able to learn philosophy, teach others his kung-fu skills, and find love in a nice girl called Linda. Whilst, on the other hand, his oriental appearance prohibited him in pursuing the role of a versatile actor, and he was only offered parts of a more subservient nature. Obviously, Bruce did not really want that for himself, or his fledgling family, and so he went back to Hong Kong, and partook in a number of modest budget films, which propelled him into infamy and beyond. 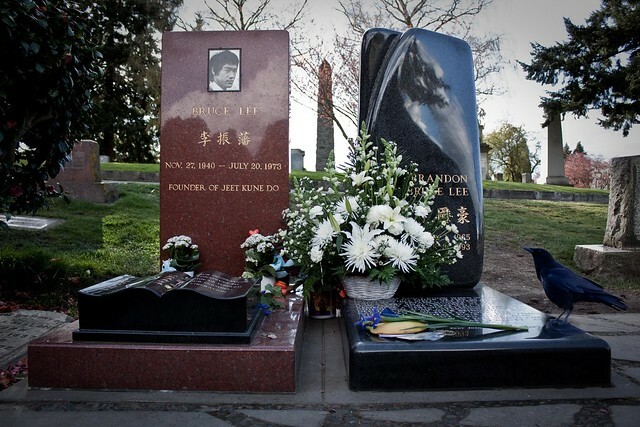 Bruce Lee died at the tender age of 32 - a death by misadventure. FOLLOWING IN HIS FATHERS FOOTSTEPS: Unfortunately, like his father before him - Bruce Lee - Brandon Lee had a very difficult time making his way in the movie industry. For a start, he was always being compared to his father's legacy. Next, he had a sigma attached to him for being somewhat of a 'wannabe', which relegated Brandon to more modest budget films. Plus, in addition to this, when he was on the cusp of stardom - with the film 'The Crow' - he tragically died by an act of misfortune. THE LEGEND LIVES ON: Both Linda and Shannon Lee have done their best in paying homage to the lives of their fallen family members, Bruce and Brandon. Linda has re-married, and still has close ties to Bruce and Brandon's affiliations. Whilst Shannon has started a family of her own, and begun acting in a Hong Kong produced action film. Bless you Lee family - you're an inspiration to us all. Now before I get to the nitty-gritty about 'Famous Families - The Lee's', please allow me just tell you about my little niggles first. (1) Like most of the programs in this series, I always find that the 'kitch' opening sequence is a trifle 'overtly Americana' for my taste. Such as the bold and operatic voice-over narration, and how Mariel starts off the show lounging around in Joan Collins' living-room. (2) Certain facts about Bruce's career in both Hollywood and Hong Kong were flossed over with fragmented segways - and this does come across as rather disappointing to a Bruce-Lee-nerd like myself. (3) Regrettably, Brandon's and Shannon's lives were not expanded upon as much as their fathers' was - and their segments only took about ten minutes of this shows time. (4) There wasn't that much 'new' on offer where Bruce's life was concerned - and some of it did seem like a rehashing of some of the other Bruce Lee documentaries I have seen [click here for more details]. And (5) Mariel had too many clothes on, and her eyebrows are too sexually provocative. However, apart from all of that, 'Famous Families - The Lees' was a really emotional experience for me too, because: (1) Linda Lee Cadwell does present herself with all of the decorum and elegance of a lady who has overcome great sorrow. For me, personally speaking, I can see the attraction Bruce had for her - what with her congenial charm and charismatic nature. 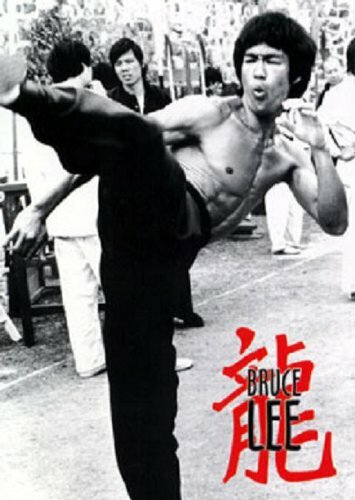 (2) I have always liked listening to Robert Lee in all of the Bruce Lee documentary's he has been in. Robert seems like a very humble and erstwhile person, and has that same spark inside him that his brother Bruce had. (3) I cannot help but feel sorrow inside me whenever I now see Brandon in a documentary. He's death was a tragic waste, and he must have had a very turbulent time following in his fathers footsteps. Plus, I would have liked to have heard some incite about how Brandon's death mirrored the 'mock death scene' in the Bruce's 'last film' Game of Death [click here for the review]. That has always troubled me that has. (4) Could you imagine hitting on Shannon Lee? Daughter of Bruce? Yeah - me too. Though I am not only attracted to her beauty, I am also attracted to how her sweet nature really does come over on screen. (5) James Coburn always tells the same story about Bruce whenever he is filmed in one of these Bruce-related documentaries. Still, I could not give a toss about this facet really - James voice is always a pleasure to hear. And (6) Kareem Abdul-Jabbar, Dan Inosanto, Taky Kimura, and John Little, really do Bruce Lee justice when they talk about him. In many ways I can almost imagine what Bruce was like in real life through their words - it's both a pleasure and a sad experience to behold. OK, so before I start crying like a baby, I best finish off this review with a thought of my own about Bruce. Now I am sure that you will agree with me when I say that Bruce Lee was a multi-faceted person. He loved his own culture. He hated racism. He cared for his family. He respected others. And he wanted to be the best of the best in whatever he did. So my question to you dear reader, is if you are against any of these things and like Bruce Lee - do you really like Bruce Lee? Nice documentary - provocative eyebrows.